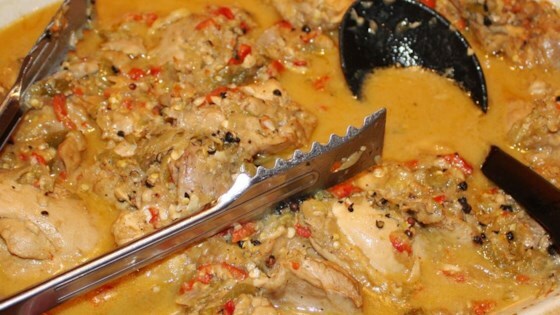 "Not your usual adobo, the coconut milk in this chicken dish makes it more flavorful." Combine the chicken, vinegar, water, sugar, soy sauce, bay leaves, crushed peppercorns, onion, and garlic in a large pot; stir and bring the mixture to a boil for 2 minutes. Reduce heat to medium-low and cook at a simmer for 30 minutes. Remove the chicken to a large serving platter and set aside. Increase the heat under the pot to medium and cook until the liquid reduces by about one-quarter, about 10 minutes. Season with salt; stir the coconut milk into the mixture. Cover and cook until the coconut milk appears oily, about 10 minutes. Pour the mixture over the chicken to serve. This did not taste like the Ginataan I am used to. Definately lacking flavor so I added some sliced jalapeno peppers and patis. Boyfriend liked it- but he's like Mikey, he'll eat anything!